Heists - a brand new 4-player cooperative gameplay experience for Grand Theft Auto Online, giving players the chance to team up and pull off a string of intense, multi-part heists, raids and robberies across Los Santos and Blaine County - are now available for free in Grand Theft Auto Online. Plan, Prepare, Execute - Online Heists span numerous missions featuring new gameplay, vehicles, weapons, and scenarios to test a team’s full set of skills: from computer hacking to stealth infiltration, precision driving to aerial dogfighting, sniping, skydiving and much more. 4-Player Teams, 4 Ways to Play - Choose your roles and strategize to complete each stage of a Heist, with tight communication and coordination the key to success. Some missions will require the team to work as a single unit, while others will break the team into separate roles to complete key objectives. Replay each Heist to experience a different perspective on the action, and complete Elite Challenges for extra cash. Additional New Adversary Modes - Brings new kinds of competition to GTA Online while new Daily Objectives and other Freemode activities bring chaos to the streets of Los Santos and Blaine County. Assemble Your Team - Create a Crew or join existing Crews at the Rockstar Games Social Club to earn additional RP rewards as you play. Play Now - Heists are now available for free in Grand Theft Auto Online for PS3, PS4, Xbox 360 and Xbox One (PC players will also get Heists as part of their GTA Online experience when GTAV launches for PC on April 14th). To get it, just start up GTAV from your online-connected console and follow the update prompts on screen. For a complete list of all of today's updates, check out the official notes at the Rockstar Support site. Have fun and crew up in the forums! It's kinda messed up how you can only use the hydra, savage and other dlc vehicles only online. Some people don't have internet to play online rock star needs to make it where we can use the vehicles on and offline. 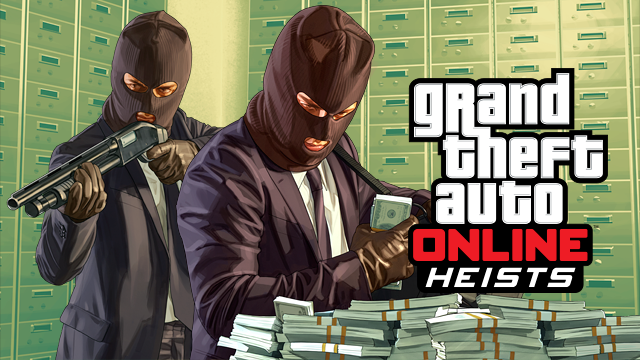 GTA Online Heists Now Available - It's been a long time coming but GTA Online Heists are now available.